My heart is heavy as I read about what's going on over in Iraq right now. I can't scroll through my Facebook news feed without seeing another article detailing the genocide along with a plethora of gruesome photos. According to Christianity Today, "Thousands of Iraqis fled to the mountains after the predominantly Yazidi (another religious minority) town of Sinjar fell, where they have no food and water. Open Doors reports that 45 children have already died of thirst as Kurdish troops have no way of getting to the stranded refugees." From what I've read, many children who didn't make it to the mountains were beheaded in front of their own mothers. I'm nauseous just thinking about it. I am ashamed to admit that I sometimes prefer ignorance when it comes to horrible things going on in the world. It's much easier for me to go on with my easy life when I don't know that there are toddlers dying of thirst with their mothers helpless to do anything about it. It really hit home for me when I saw a photo earlier this morning of a toddler, around the same age as my very own daughter with three rifle barrels digging into his head. I tried to imagine how I would feel if that face was replaced with my own sweet daughter's face. The horror. We can't go through our day without our morning latte, a daily check-in on Facebook, snapping a jillion photos of our cute kids (or selves) on our smart phones, and if the cable isn't working right at the end of the day, we get all frazzled and bent out of shape. Our brothers and sisters, not just in Iraq but other countries as well, are dying for their faith and we can't handle a day without coffee. Put a pause on life with me for a second and let the gravity of what is going on in Iraq really sink in. Don't block it from your mind because it's hard to think about. Let's allow their persecution to give us a little perspective in our own lives, and then let's pray for them. Don't just scroll through the photos and posts to satisfy your curiosity and then go on with your day. Let your heart be heavy with the reality that men women and children are dying for what you believe in and take for granted all too often. And let that heaviness take you to your knees crying out to God for his mercy and grace in Iraq. Pray for our brothers and sisters to be filled with peace and a confidence that God is faithful. Pray for the comfort of mothers who have lost their sweet babies, wives who have lost their husbands and husbands their wives, children who have lost their parents and families who have been torn apart Job 5:11: "The lowly he sets on high, and those who mourn are lifted to safety"
Pray for the Iraqi Christians to have a confidence in the love of Christ surrounding them. Romans 8:37-39: "No, in all these things we are more than conquerors through him who loved us. For I am convinced that neither death nor life, neither angels nor demons, neither the present nor the future, nor any powers, neither height nor depth, nor anything else in all creation, will be able to separate us from the love of God that is in Christ Jesus our Lord." Pray for them to have hope. I don't know about you, but when I'm done praying, I'm going to hug my sweet daughter and thank the Lord for our safety and freedom here. 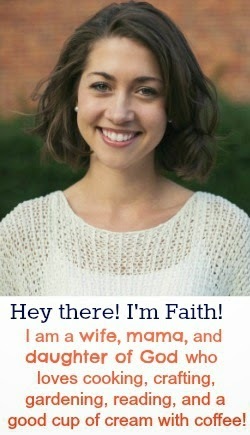 It's only by God's providence that she isn't in that photo with the gun barrels to her head. May I never take that for granted. I'm in tears with a heavy heart! And thank you so much for educating me with this matter. I heard about what was going on and had planned to do more research. This is exactly what needs to be heard girl and you're spot on! 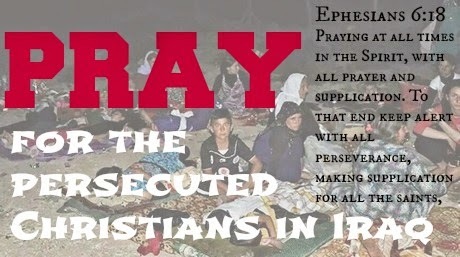 Let's all pray victory over Iraq Christians. The very victory Christ died to give us. Thanks Heather. Praying with you! it is hard to read about because it's so hard to comprehend such evil exists in the world and it's heartbreaking to be so helpless about it all. If praying is all I can do, at least it's something. Yes, it's one of the most powerful things we can do as well! Yes, mine as well. Thank you for the encouragement.